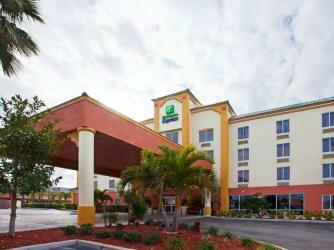 While Florida is famous for its sunshine, beaches and entertainment options, the Holiday Inn Express & Suites Cocoa Beach reputation is built on their commitment to providing you with a comfortable stay. If business brings you to Cocoa Beach, this hotel's easy access to Route 520 and I-95 puts you close to the Cocoa Expo Center and NASA's Kennedy Space Center. The hotel's amenities include free high-speed, wireless Internet access, a pool and spa and a fitness center. We also have the complimentary Express Start breakfast bar, which is served every morning. Our hotel's staff in Cocoa Beach, Florida handles the little details so you can focus on all the fun. Book your next stay with us today! Only two blocks from the beach, sink your toes in the sand or go for a swim. From the charm of Cocoa Village to the technology of the Kennedy Space Center, there's no shortage of entertainment in and around Holiday Inn Express & Suites Cocoa Beach.